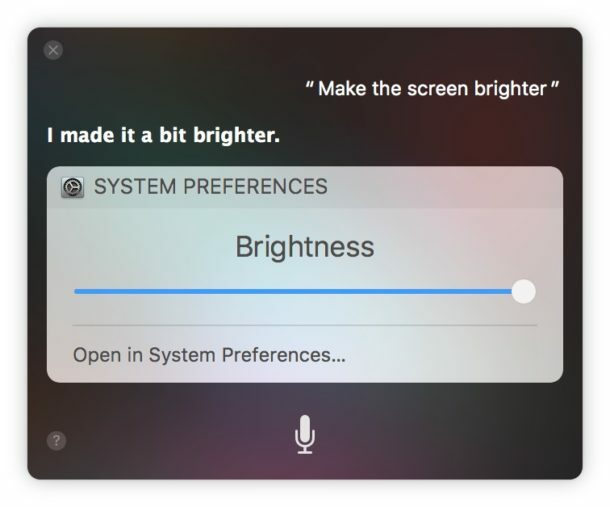 Just about every Mac has screen brightness adjustment buttons on their keyboard, but for Macs with Siri enabled you can also adjust and change screen brightness on a Mac display easily with Siri voice commands instead. This can offer a quicker option to adjust display dimness and brightness for some Mac users, and voice commands offer an alternative approach to the keyboard adjustments and Display preference panel adjustment options. Hit your keyboard shortcut to activate Siri (the default is holding down Option + Spacebar), then issue your voice command to increase the screen brightness. Press your keyboard shortcut to activate Siri, then issue the appropriate voice command to adjust down the screen brightness. 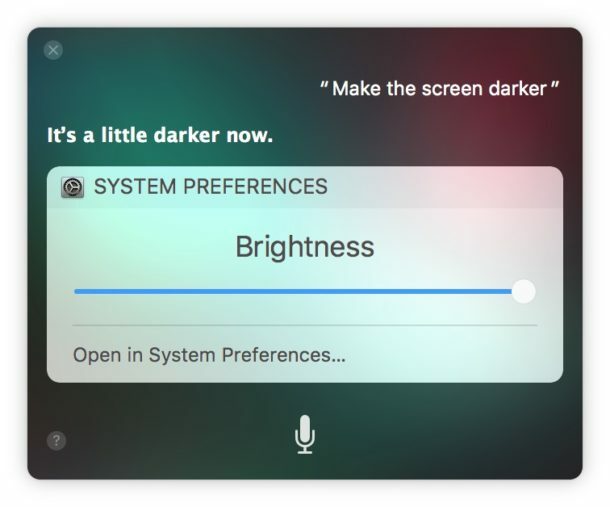 Making the screen darker or brighter is just one of many commands that Siri can do (and yes it works on the Mac as well as iOS).You can find many other helpful Mac Siri commands with this list here, and query Siri directly for command ideas too. It’s worth mentioning that if you turned off MacBook auto-dimming that adjusting the screen brightness won’t change itself again if the ambient lighting situations change, so you’d need to adjust it again on your own through Siri or otherwise. Is this faster than simply hitting the screen brightness adjustment buttons on Mac keyboards? Probably not for most users, unless perhaps you have a Touch Bar Mac where the virtual function buttons can be buried under app specific virtual buttons, but it’s really up to you and how you use your computer. OMG why would anyone go thru all that when you can simply touch the function key and brighten or dim the screen? And what if someone is playing a game with a game controller and doesn’t want to reach the keyboard? Or what if someone has a disability and using voice control is easier than pressing a button? What if you’re helping someone else who doesn’t know a thing about the Mac and it’s easier to tell them to use a voice command? Or maybe you just think Siri controlling the brightness is interesting? Not everything is going to apply to you, that’s life. Try to imagine where things may apply to people not exactly like yourself. I played with this for a bit – you can ask Siri “full brightness” or “max brightness”. which turns it all the way up. Siri also responds, to: “Reduce the brightness” or, “Increase the brightness”. Siri also responds in a similar way for volume requests too.